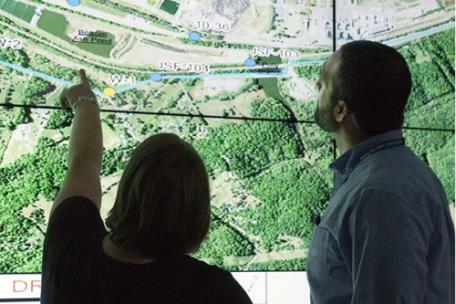 Of course TVA works around the clock to protect its dams, nuclear plants and transmission assets safe from harm in the case of seismic events. But it takes just as much care to protect its coal combustion residuals. It’s not everyday an earthquake makes big news in Tennessee. As we learned on Dec. 12, 2018, any shift Mother Nature makes attracts the immediate attention of the Tennessee Valley Authority. While TVA dams and nuclear plants garner much public attention around earthquakes, the utility also goes to great lengths to protect their coal combustion residual (CCR) units [coal ash] from the region’s seismic activity. TVA is the first utility in the world to implement this level of technology to monitor CCR storage. Mr. McClung, who leads the team that keeps an eye on TVA’s coal ash, says that the utility has invested about $2 million to develop a system to identify and respond to any CCR issue before it becomes an emergency. According to Mr. McClung, TVA’s CCR sensors collect data as frequently as every five minutes. TVA engineers look for any changes in the sensors that access stability or water levels, which may signal a potential problem. Additionally, all TVA CCR sites have a specialized inspection plan with detailed instructions of what to do should an earthquake or other natural disaster occur. Mr. McClung said he did not feel the 3:14 a.m. CT quake, but once his team notified him, he knew it was going to be a big day for his staff. TVA’s CCR engineering team enacts its special inspection plan for earthquakes measuring 4.5 or more. Even though the recent earthquake that occurred in Decatur, Tennessee, measured 4.4, Mr. McClung explained that it was determined that TVA would deploy the specialized inspection plan since the rating was so close to the required number. “That morning we immediately deployed field staff and engineers to the [CCR] sites to ensure there were no issues,” Mr. McClung said. TVA engineers cross-checked data sent through the sensors called piezometers (which measure water levels in CCR facilities) and inclinometers (which measure the incline of a slope). These instruments are critical to determine any shifts or changes in CCR sites. They are part of the cutting-edge network of devices that provide 24/7 monitoring information for diagnosis and deployment. Within 24 hours of the earthquake Mr. McClung’s team reviewed the data and could ensure there were no issues at any CCR unit near the quake.